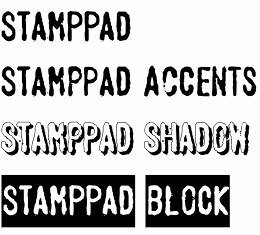 Stamppad typeface is a modern font family that is based on a very interesting and original idea. In fact it is a digital image of what you will get if you use a rubber stamp pad – a very bright concept that will not occur to many designers out there. As with the original rubber stamp pad, it is an All-Caps typeface. It has pronounced grunge appearance and is so realistic that it feels like you could be stained with ink if you touch it. 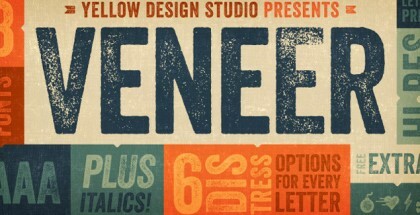 This truly makes this typeface unique and we recommend it for use in logos, posters, signage, branding, T-shirt design, covers, cartoons, etc, or simply anywhere a bit of original flavor is required. 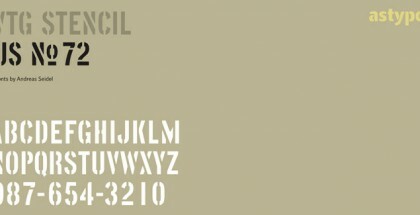 Although Stamppad has its roots in something so basic, generally it is a contemporary typeface that offers quite a lot. It contains six fonts, each one packed with all kinds of modern features like Standard and Discretionary ligatures, Stylistic Alternates, Sups and Subs, slashed zero and fractions. We start with the Regular version – the ordinary All-Caps one. Then we have Accents – with special attention paid to accented characters; Small – with smaller lower-case letters; Black – a very interesting font which is like a negative image; Block – pretty much the same as Black but with individual space for every word which makes it look like a block; and finally the Shadow one. Naturally, all the fonts are designed in a manner which allows them to work perfectly together. Also there is one very useful feature provided, as each font has special characters for all kinds of double letter combinations. And, of course, we have to mention the very rich language support for virtually all European languages. Stamppad typeface is designed and released by the Southampton based Aah Yes type foundry. We hope that they will keep on with such bright and original ideas and wish them luck! Get Stamppad and enjoy this fresh idea!